The fitness world is experiencing huge shifts, and it’s making it an incredibly profitable business. From SoulCycle to CrossFit boxes to the popularity of Tough Mudders, people are spending more money on fitness. 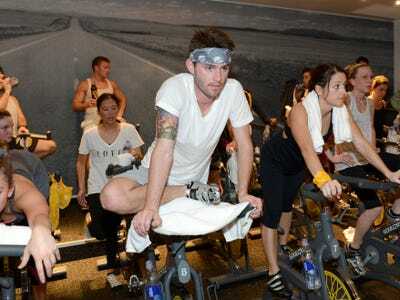 SoulCycle even filed for an IPO last summer. The only brands that are thriving, unsurprisingly, are activewear brands like Nike, Under Armour, Lululemon. Oddly, fitness can be a pretty pricey endeavour — so why are people forking over money to fancy classes? The social aspect is huge. Kelly points to the notion of sharing what you’re doing Twitter and Facebook, but perhaps more notably, the idea of having a community. It’s already true that fostering a community is a way to build a strong — and perhaps cult-like — brand. Lily Lawrence/Stringer/Getty ImagesPure Barre is another way for people to define themselves with a fitness community. “In past times, it was wearing a Polo shirt or wearing a certain kind of shoe or … a certain type of clothes sort of helped identify [you] as a part of a tribe, and now it’s something you do,” he said. All of that means someone would rather be defined by spending her money on SoulCycle classes and “riding with the pack” versus throwing money down on a J. Crew dress. And besides, if she documents it on Instagram, that experience could live longer than that dress would have, anyway.